It is so good to see that many designers are ditching wood veneers in favour of the real thing with a clear move towards solid wood and traditional craftsmanship. So today's post is a celebration of this age-old natural material and its wide reaching relationship with interior design. 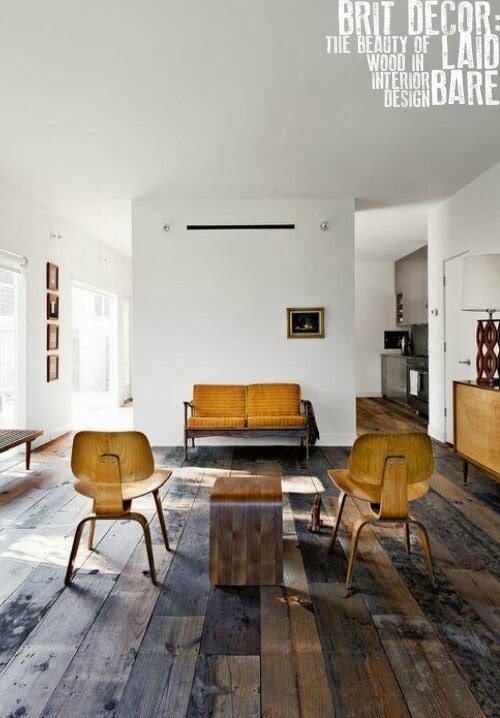 Let's start with the beautifully texture-rich look in the first image (above) and the striking dark wood flooring, which takes centre stage in this room. The warm tones of the wood grain provides the perfect palette when mixed with the lighter tones of the mid-twentieth century furniture pieces and look how these colours are mimicked in the rich copper shaded upholstery with a strong emphasis on warmth and glowing tones. When faced with such incredible depth from the flooring and furnishings, a neutral wall paint seems the only way to go for that statement finish! The second look is clearly defined by the pale 'blonde' wood in this Scandinavian-style room, which would make the perfect setting for yesterday's selection of Scandi-style Christmas decorations! I find there is a distinctive purity to lighter woods which can create a refreshing look without feeling cold. 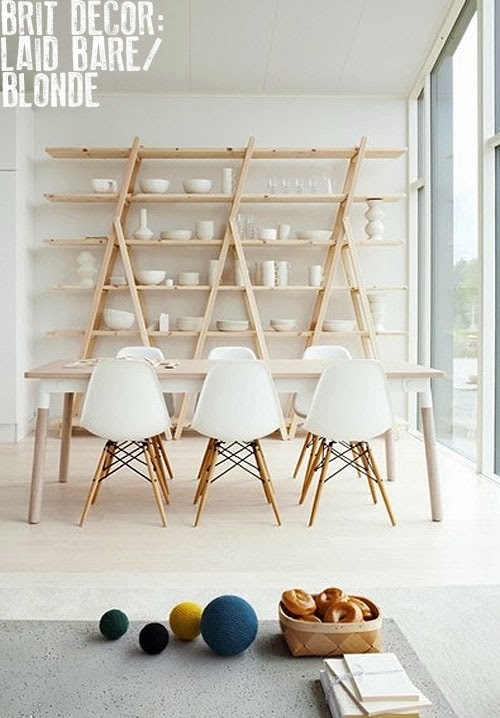 Mix these blonde woods with bright whites like these Eames chairs and you have a stunning contemporary Nordic setting. Finally, incorporating wood into an interior scheme doesn't have to be all about neutrals as the third image clearly shows, painted wood can be equally as beautiful. 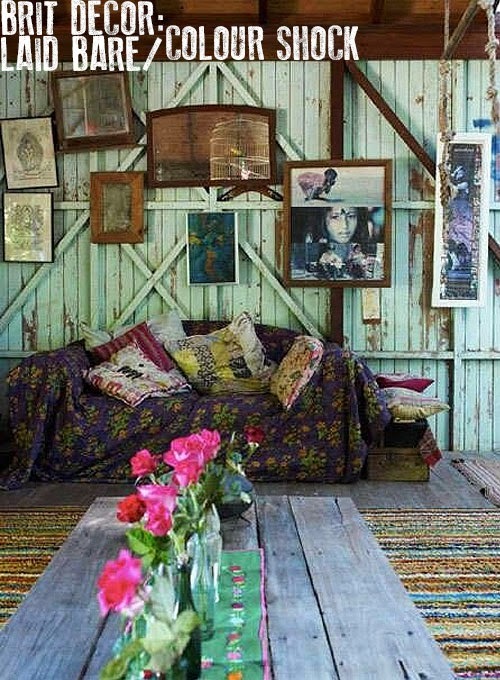 For knock-out texture, use a distressed paint technique to reveal layers of colour as well as adding character. I love the pale mint colouring of the wall panels combined with the fuchsia pink of the roses!! 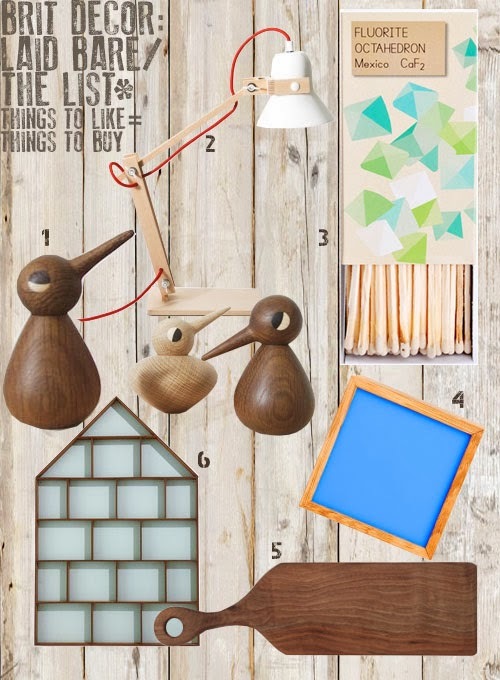 Of course today's feature wouldn't be complete without a shopping list of real-wood accessories to compliment the 'laid bare' look. I hope you enjoy! Great floor in that first photo. The textures & colours are so inviting aren't they!